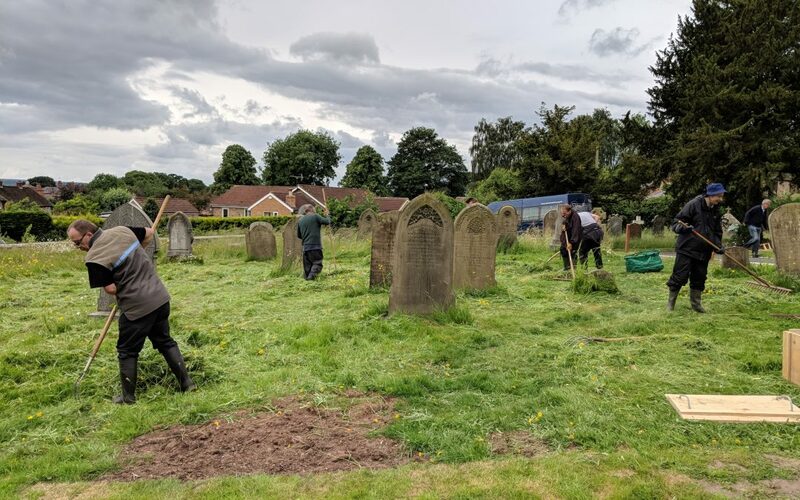 On Friday 15th June, the weekly Conservation Group from Open Country visited St John’s Church in Sharow, near Ripon, to help manage their churchyard and finish off their impressive ‘Conservation Week’. The church has recently received backing from the Heritage Lottery Fund to conserve both their church building and churchyard, which has helped to improve the facilities at the church, clean and replace their unique stained glass windows, and manage their churchyard for the benefit of wildlife. The week kicked off with a visit from ‘Caring for God’s Acre’ who facilitated a workshop and talked about the benefits of turning churchyards into wildlife havens; followed by discussions with the Lower Ure Conservation Trust and the North Yorkshire County Council ecologist on Tuesday about transforming grasslands into wildflower meadows. Wednesday saw moth traps being set for a local school group to check on Thursday morning, shortly after which scything expert Steve Tomlin led a workshop on scything and hay-making – a fascinating demonstration on the best methods and techniques for this simple and effective tool which is re-gaining its popularity. Open Country’s visit on Friday topped off the week, bringing along our Conservation Group which is made up of individuals with learning disabilities and mental health issues, supported by a few of our regular volunteers. One of the charity’s great assets, a BCS auto-scythe, was put into good use during the morning, helping to cut the spring meadow. The group worked extremely hard raking up the hay cut by the auto-scythe, and were spurred on by a wide selection of homemade cakes and biscuits, washed down with plenty of cups of tea and coffee. The skills learnt on the scything workshop on Thursday were also employed when working closer to the gravestones, areas of the meadow which the auto-scythe was unable to reach. Overall the day was a fantastic success, in both the work which was achieved, and the strengthening relationship between wildlife-friendly churches and Open Country. The day exemplified the great work which the various Open Country conservation parties does around the county, working with both small and large organisations and community groups to help wildlife to flourish, and make the countryside more accessible for everybody!